I was five or six, and for some reason, every so often in assembly, we would sing ‘Yellow Submarine’ — I had no idea who the Beatles were, let John Lennon who had just been shot, although not in my assembly — and less frequently, but with no less gusto, ‘Sinnerman’ by Nina Simone. If you look at me closely, you can tell I didn’t grow up as an African American, and yet, the reasons lost to me (and probably the whole of my 1970s hugely white suburban, middle class, Catholic primary school outside Reading), our perm-laden television-sized glasses wearing music teacher used to get us all tunelessly belting these out like some disfunctional gospel choir. To a child just grasping the concept of a cat sitting on a mat, Yellow Submarine is a suitable song. But why anyone would sing a song questioning where some cinnamon was going, where it was running to, where it was going to hide was beyond me. To this day, the two are superglued firmly together; Simone’s song and some aromatic tree bark. When I cook with it I sing the song and when I hear the song I think of the spice. It’s a strange place, sometimes, the mind. To that end, today’s recipe is cinnamon buns. 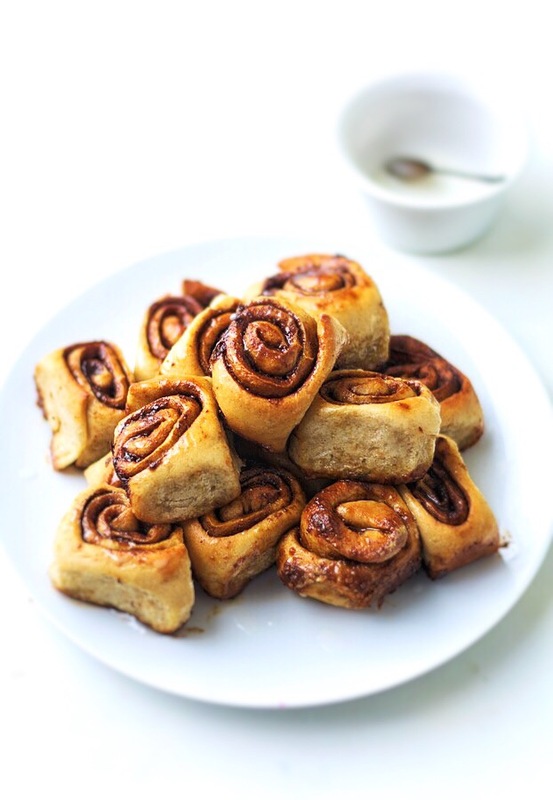 Soft, sweet, pillowy spirals of spiced dough wrapped around melting, sugary cinnamon butter. I quickly made these while waiting for a beetroot chutney to finish cooking. A nice treat, I thought, for the children to come home from school to. They don’t go to after school club on Mondays, so they need something to keep them quiet for a little while. Noah loved them. Silence for a calm ten minutes. Maya took one bite and threw the rest in the bin. In the town, where I was born, that would have got me a clip round the ear. Mix the yeast with a tablespoon of the water and leave somewhere warm for about five minutes. Pour the flour, salt, brown sugar, 1tbsp of cinnamon and the water into a bowl and mix well until you have a soft dough. Almost sticky, but not quite. Knead for ten minutes (stand mixers and processors are handy here) and leave somewhere warm until it has doubled in size. This could take between 30-60 minutes. Longer, probably, if you live in Alaska. Dust the worktop with some flour and roll the dough out into a 25cmx45cm rectangle. Melt the butter, 75g sugar and 2tbsp ground cinnamon together and pour evenly and carefully over the dough. Sprinkle the sugar all over the top and give it a little light roll with the rolling pin. Roll up along the longest edge until you have a long cylinder and then cut evenly into 15. Put face up in an oven tray and leave to rise again for 45 minutes to an hour. Cover the tray with some film so they don’t dry out. Heat the oven to 180c and bake for about 25 minutes until golden and springy. I think it was about this long, I’d forgotten to set the timer. Just cook them until they’re done. Remove from the oven and leave to cool in the tray for five minutes then transfer them to a wire rack. Mix together the icing sugar and water until you have a smooth glaze then drizzle over the buns. Serve slightly warm if you like. Congrats for the blog by the way, I envy your photos… it’s evident it’s a pro’s handiwork 😀 I love your language and that pinch of irony that make it more interesting and easier to read. I am just at the beginning here on wordpress… if you’d like to help my project grow, visit my blog (although I didn’t write much about food so far, but a lot is going to come briefly!). Thanks. 🙂 I shall have a look.